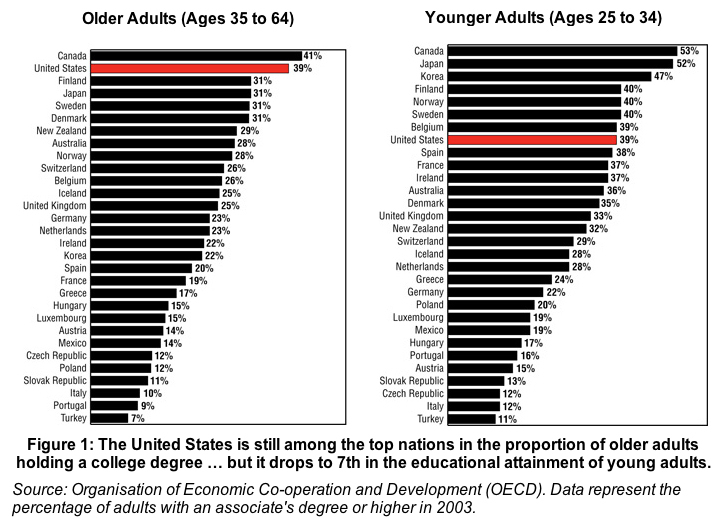 Over the last quarter century, Americans got used to the idea of their children going on to colleges and universities. In the early 1970s, about 8.5 million Americans attended such institutions; by 2004 the number had doubled. The US population across this time rose by less than 50%. This spectacular growth in our student population reflected the pent-up demand of the mass of Americans for what they had viewed as a luxury as well as a ticket to better jobs and higher incomes. The demand would have far exceeded the supply had not most of the states rapidly increased facilities for public higher education. 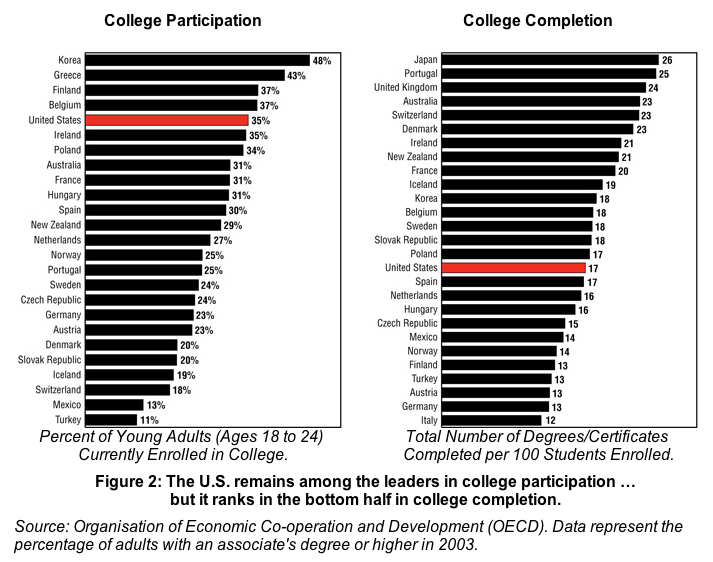 Today, the vast majority of US college and university students attend public, not private, institutions. Yet therein lies precisely the problem. The last quarter century, and especially the last decade, have also moved the country rightward towards less government provision of social services (like public higher education) and more privatization. Real wages have stagnated since the 1970s, so most Americans are finding it ever more difficult to pay for public higher education. Meanwhile its costs have been rising far faster than the general level of inflation. We are on a collision course in which a historic demand for higher education — which has now become an embedded expectation for half the population — confronts a rapidly escalating rationing of enrollment by cost. Social tensions and rising resentment and anger are sure to follow. Let’s take the example of the main campus of a major state university: the University of Massachusetts at Amherst. Approximately 25,000 students, undergraduate and graduate, attend that university. About three quarters come from Massachusetts households. The total cost for in-state undergraduate students went from $2,340 in 1978/79 to $16,584 this academic year. That increase was three times as big as the rise in the consumer price index over the same period. The increase was larger still for out-of-state undergraduates. Given that real wages stagnated across this period, paying for their children’s college-level education presented families with an ever rising level of financial difficulty. No wonder the data show that American workers over the last 25 years steadily increased the number of hours worked per year (multiple jobs and/or more overtime). No wonder those families increased household debt at historically unprecedented rates to historically unprecedented levels. Nor is it any wonder that students now graduating US colleges and universities do so with increasing levels of personal debt (in addition to their parents’ household debt) taken to pay part of college costs. The US Department of Education says that in 2004-2005, two thirds of students graduated from colleges and universities with debt (averaging $15,500 at public schools and $20,000 at private schools). In New York, which runs the nation’s largest system of public higher education, the average debt was $21,000 then, and it is higher today. Several lessons flow from this situation. First, many parents have reacted strongly to the additional stress and exhaustion (from the increasing hours of paid work they have undertaken) and the additional debt anxieties (from the fast rising levels of household debt) incurred since the early 1970s to finance runaway college costs. Some have turned against higher education in a deepening rage about the financial burdens that it imposes. This can take the form of hostility toward teachers and teachers’ salaries in so far as these are blamed for rising college costs. It can take the form of a cultural turn against higher education: viewed increasingly as an unnecessary and useless distraction from “real” life and a job or as a luxury indulgence for the idle or both. Most likely, anger about college costs will flow into the growing “middle class malaise” that fuels the rhetoric and campaigns of many Democrats and mystifies so many Republicans (at least, those who don’t simply deny it or its basis in hard realities). Nor have matters been improved as public universities, to save costs, resort ever more to substituting overworked and underpaid “adjuncts” for the full-time tenured faculty who used to do most of the teaching. New PhDs face ever fewer tenure-track jobs and so must take multiple adjunct positions at different institutions. They have far less time for each class and little or no time for the research that should enable them to keep up with their discipline and improve their teaching across their working life. Grossly underpaid in comparison to what tenure-track teachers get, they resent their situation. Rising pressures not matched by rising resources, respect, or remuneration also provoke more dissatisfaction and resentment among the relatively shrinking portion of tenured professors. The deteriorating circumstances of the teachers spill over to diminish the educational experiences of the students. The students have thus been required to pay ever more for ever less in the way of educational services. What keeps students in school is the terror of facing a deteriorating job market without a degree. They remain students despite the quality of their classroom experiences. Nothing better illustrates all these trends than the current rapid proliferation of “distance-learning” — the prevailing euphemism for internet-based courses. In them, very low-paid adjuncts administer electronic courses that students increasingly substitute for the formerly in-person engagement with tenured professors. In many state universities, faculty reductions have so limited classes that undergraduates find it necessary to add an extra semester or two (and its heavy costs) to get sufficient classes to graduate in their chosen major fields. Offering such students “distance-learning” via the internet is proving a profitable new opportunity for such universities. The finance-driven turn to adjuncts and distance learning widens the gulf between public and private higher education. The private colleges and universities see the decline of public colleges and universities as a competitive opportunity in the business sense. The democratization of higher education had been notably advanced after World War 2 when the states built up first-rate institutions that often outperformed the best and oldest private institutions. Now, that short-lived democratization is unraveling and with it the quality of higher education provided to the majority of our students. A differentiation of first (private) and second class (public) higher education is hardening into the norm with many state and community colleges sinking further into still lower quality educational experiences. It would be hard to exaggerate the complex consequences of these developments for many years and in many domains of our society. Now (That the Dems Have Taken Back Congress) What?